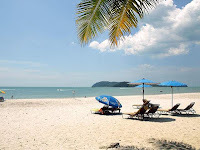 Pantai Cenang is best suited for those who loves crowd ~ this beach is always popular with all types of people. The surrounding area is crowded with resorts, hotels and inns, with many of them within walking distance to the beach. A shopping complex that offers an attractive range of duty-free goods.